Interactive artist and music producer Scott Whitehead profiles two iOS music apps from developer Igor Vasiliev that allow you to record and mangle sounds in real-time. 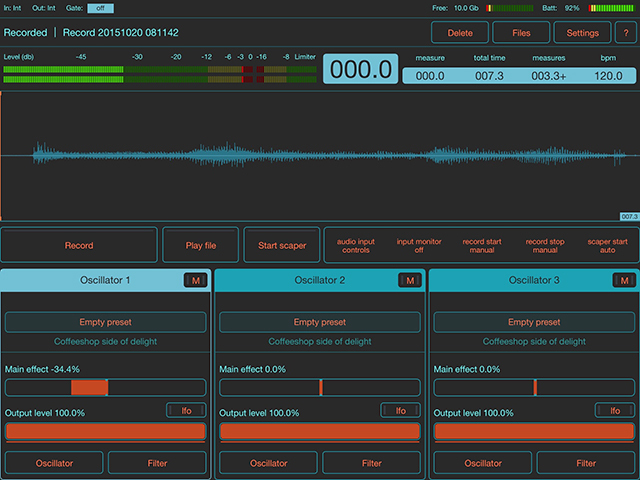 FieldScaper and SoundScaper both offer a wide set of tools to the non-traditional sound artist. SoundScaper is a sample-mangler that uses ideas borrowed from circuit bending and applies them in an almost modular synth fashion. At its most basic, up to three audio files are played back with control over the speed and, therefore, pitch. A sophisticated reverb, filter and delay are added. Multiple complimentary low-frequency oscillators can evolve these settings a lot or a little over time. SoundScaper’s secret sauce is the ‘bent circuits’ that are added to the signal chain. There are up to five of these with configurable circuit hacks. They’re either triggered in a rhythmic pattern or engaged full time. Enabling options under these ‘circuits’ feels like a glitchy bit crusher effect crossed with a grain effect. Different sections of your file will be played and possibly have broken bits which adds distortion and digital textures. There’s no waveform display so you either have to use your ears to figure out what’s going on or experiment until you like what you get. Additional distortion and gate controls ensure that no one will recognize your source material. FieldScaper was released after SoundScaper. It refines some of its cousin’s ideas and retains many of SoundScaper’s charms while adding new features and simplifying the interface. FieldScaper is presented as a tool for recording and manipulating field recordings – but it’s much more. You can record audio through your built-in microphone or attach a USB mic via the camera connection kit. You can also upload audio files from your PC using the very cool web upload feature common to both apps. Up to three audio files can play simultaneously and selections of each audio file can be sped up or slowed, distorted and filtered with reverb and delay applied. FieldScaper adds an interesting take on the circuit bender from SoundScaper. There is only one of these instead of five, but an additional control labeled “Mask shifter” allows for more musical tweaking. FieldScaper has an LFO for nearly every effect control and a range of options for each effect such as a type of reverb, filter type or distortion type. Similar to its cousin, the labels on these are not always clear but also similar to SoundScaper, it almost doesn’t really matter how they do what they do. FieldScaper falls easily to the hand – while you are playing back a recording you can easily tweak the filtering, add some LFO to the distortion, dial back the delay. Igor Vasiliev’s other iOS music apps offer excellent sound quality and definitely show that he understands audio. These two more recent products are decidedly Lo-Fi. SoundScaper is not the tool for the type-A musician. Rather, if you like happy accidents and tweaking settings as you listen, SoundScaper will reveal the material within the material while overlaying a little of its own flavor. FieldScaper, on the other hand, offers slightly more predictable results but can still get very weird through the very freaky delay and circuit bender options. These interfaces take some getting used to and some of the labels might only make sense to an experienced circuit bender. But none of this matters. The features reveal themselves over time, and these instruments are about taking chances and making evolving sounds as you play. A MIDI learn function means as you start to develop your practice you can assign your favorite settings to a physical controller. Musicality could be improved with MIDI clock sync for the LFO’s, and the UI would benefit from another look at the labels and sliders in the user interface.